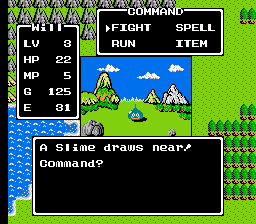 More specifically, let's look at combat in Dragon Warrior. It's pretty basic. Only 4 actions to choose from: FIGHT, RUN, SPELL, ITEM. Seemingly worlds apart from the "free to try anything, and your referee will come up with a ruling" land of OSR and other tabletop RPGs. Even by comparison to other JRPGs, it looks like a limited and kind of boring list of choices. Compare it to, say, Final Fantasy 5, with its huge system of jobs, skills, summons, different types of magic, and ability to create characters with their own customized list of actions. Even at the time DW came out, I think most people quickly fell into the "fight, fight, heal, fight, fight, heal, keep repeating until you're at a high enough level to do the same in the next area" pattern. But have you ever tried to play through DW at as low of a level as you can? Not waiting until you've ground enough XP & levels to tackle the next area without any challenge? Throw caution to the wind and just see what you can do with those 4 combat actions to make it through? The game changes quite a bit. You learn that even though you don't have many choices, what action you choose actually matters. Some enemies are especially vulnerable to your SLEEP spell. Some are completely shut down by a successful STOPSPELL. HURT is a better trade-off of time vs. resources vs. XP at other points. Learning your enemies and making good choices allows you to defeat enemies that "fight, fight, heal" would not have. All attacks result in HP loss, and fights usually end quickly. You either chose a good action and win the fight in a couple rounds with minor HP loss, or you quite likely die. In short, DW fights are quick, decisive, and their choices are meaningful. Our detour ends here. "...there are no to-hit rolls..."
Hang on. Back up. What video was I kinda listening to? Into the Odd? Let's rewind this and watch the whole thing. Whoa, sounds like this game gets it. I download and read the free edition. Whoa, I think this game gets it. Yeah, this guy gets it. I purchase and read the full version and begin looking for any excuse to run a trial one-shot. Luck had it that attendance was sparse for my next scheduled games. Only 2 players. Not really enough to continue the campaign with, but the perfect number for a one-shot. I ended up running two separate groups of 2 people through the Iron Coral expedition. And everything worked great. Character creation was quick and gave each party different tools and quirks to play with. Exploration through the dungeon was easy to run. Reminded me a lot of running my OD&D campaign. The creatures were unusual and my players spent time trying to study them out. Mental energy needing to be spent on system instead of setting? Even my first time running it, practically zero. And combat was quick, decisive, and the choices meaningful. Combats lasted just long enough for the players to make a few decisions. They were deadly enough that those choices mattered. The players could wildly modify their approach mid-conflict, which was something that doesn't really happen in Torchbearer. And the big surprise: at the end of the second one-shot, one of my players asked, "So is this a horror RPG system?" Had I accidentally stumbled upon the dungeon tension I wanted as well? I wrote that Dragon Warrior dungeons are tense because of limited light and dwindling resources. Torchbearer has systems for managing those, but never really felt tense. Into the Odd has no systems around light and encumbrance, but my players thought they were playing "a horror RPG system". Why? I now think that tension comes down to limitation and control of information. In Dragon Warrior, torchlight greatly limits what information you have about the space around you. As the radius of a RADIANT spell shrinks, you can literally see information disappearing from around you. Meanwhile, what information does it give freely? How close to death you are -- prominently displayed HP and an ever reddening screen. How far away from the exit you are -- music that gets slower and creepier the farther you go. And how lost you are -- the awful sound every time you bump into a wall. TB was doing almost the opposite: obscuring information about risk, freely giving information about light/darkness. So what does Into the Odd do? As far as knowledge of risk, that is front-and-center. HP & STR numbers. After a single auto-damage combat, players are going to be fully aware how quickly they can lose those. In the second one-shot I ran, one of my players happened to get the "sense nearby unearthly being" quirk. So that's even more information on risk that they're being given. They know with certainty that there is something nearby -- they just can't see it yet. Whether intentional or not, that is a dim light description! From a distance, you only get a vague sense of what things in the room are ("meaty pile"). You have to take a risk, get up close, and shine a light on it to see them clearly ("former dog"). The descriptions are like this throughout both adventures in the book. Limited information you can get at a distance; full information you have to get up-close and at-risk to see. After several rooms of being keenly aware of their risk and unable to examine their space from a safe distance, is it any wonder my players thought this was a horror RPG? And all done without a single rule saying how long lanterns last or how much light they provide. Needless to say, I've started writing all my room descriptions in the same format as ItO. For now, I think I've found a game that can: a) do the quick, meaningful fights I liked from Dragon Warrior, and b) free and inspire my mental energy to create the dungeon tension I like from DW. What's the bigger point of all of this? ¯\_(ツ)_/¯ Description is more important to tension than mechanics? Mental energy is a limited resource that both managing system and managing setting draw from? Dragon Warrior/Quest 1 is the pinnacle of RPG design and everything has been downhill since then? Okay, not that last one. I like the game (and love the series), but I'm not that nostalgic. Maybe a future post on how Dragon Quest is more OSR than Final Fantasy?